The Springer Spaniel is an incredibly versatile and will try anything with great enthusiasm. A lively, energetic dog best suited to an active lifestyle. In general Springers aren't troubled by serious health problems, and hereditary diseases in the breed aren't widespread. Progressive retinal atrophy (PRA). PRA (cord 1) mutation is the most common form found in the breed. Hip and elbow dysplasia affect the hip and elbow joints; PRA is an inherited, untreatable eye condition that results in blindness; glaucoma is increased pressure within the eye - it's extremely painful and if not treated promptly will result in blindness; fucosidosis is a progressive disease of the nervous system that is severe and ultimately fatal. The disease, which affects young adult dogs, is caused by an absence of an enzyme called alpha-L-fucosidase. It can affect all Springer Spaniels, whether working or show - and don't let anyone tell you otherwise! All parent dogs must be DNA tested for the PRA (cord 1) mutation and fucosidosis; dogs who are carriers shouldn't be bred from. Clinical eye examinations should be carried out regularly to identify any potential problems early on. It's recommended that you get a puppy from parents who have been hip and elbow scored. A natural extrovert, but shouldn't be hyperactive. Obedient and extremely eager to please. These dogs are innately happy and are incredibly loyal, friendly, and affectionate, especially towards their human family. They are very sociable and love to be included in family activities. Springers are natural extroverts, but shouldn’t be hyperactive, and, given the correct training with an understanding owner, are obedient in the home, and while out and about. As they are not large dogs, they can happily live in a small house, providing they have a large, secure garden. If necessary, they can adapt well to urban life, but will thrive in the countryside and love the chance to go for long jaunts at a moment’s notice. They can also live happily with other dogs, children, and even cats. A lively, energetic dog best suited to an active lifestyle. Adapts to urban life, but will thrive in the country. Loves human company and craves his owners' attention. Must be stimulated or may become very hyper. Needs a good two hours of exercise a day. Neither strain of Springer are lapdogs — they are lively and energetic dogs, meaning that they require at least two hours of walking every day. They were bred to work in the hunting field, and like being given a job to do, which makes them a popular choice as sniffer dogs for the police. It means owners must understand their dog’s strong desire to work and be willing to put in a lot of time throughout his life, particularly in terms of training. Their intelligence and athleticism make Springers ‘all-rounders’ perfectly suited to owners who want to take part in canine activities, such as obedience, agility, tracking, and so on. Once adequately exercised, they are happy to curl up on the sofa at the end of the day with their owners. Very easy to train, but must start straight away. Can become naughty if not trained at an early age. Once training has started it must be carried through. Incredibly versatile and will try anything with great enthusiasm. Due to his feathered coat a Springer requires a lot of grooming. Grass, twigs, seeds, and other debris are easily picked up in the coat. A Springer needs a good daily brush through. If knots and tangles aren't tackled promptly they will form painful mats. Ears need checking and cleaning regularly otherwise they will be prone to infection. A fairly hardy breed that is easy to feed. If you opt for a show Springer don't feed him a high-protein diet unless you intend to work him sufficiently to burn it off. 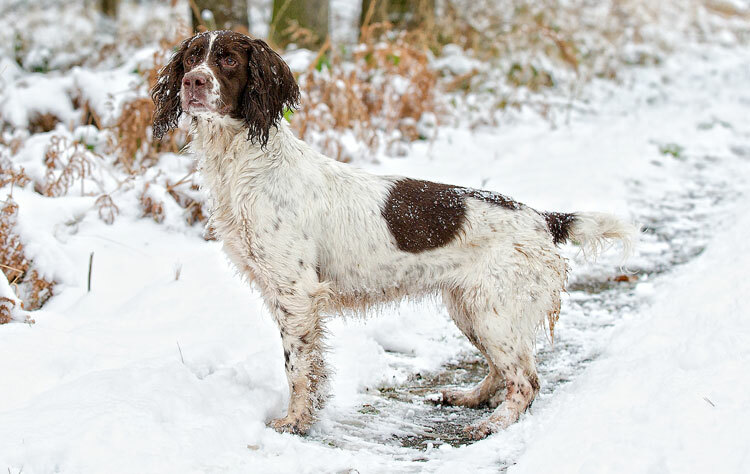 What is the difference between a working and show Springer Spaniel? Working Springers, although less highly strung, are incredibly energetic and always on a mission. In appearance they can vary, but tend to be of lighter build, and longer than they are tall, whereas the show type is slightly larger and broader. Working Springers can be quite small, their ears are set higher on the head, and their coats are much shorter and less feathered than their show counterparts. While working Springers are often cheaper, they aren't recommended for the average pet dog owner. It's best not to choose a working Springer unless you intend to work him.